The eighth installment in the ‘Fast and Furious’ series had Charlize Theron and Vin Diesel as lacking leads, but it made up for in riveting action scenes. “F8” delivers enough of the typical bedlam to satisfy one’s appetite for vehicle-related destruction. However, it feels like the series is starting to sputter. “F8” came close to knocking me out — literally. There is an addition to the usual fare of fights, car races and explosions that breaks the one rule of the “Fast and Furious” universe. Logic? That stays in the parking lot. Physics? I never took that class anyway. But a plot? No. Please, if there is one thing the people who make “Fast and Furious” movies should never do it is try to write a story. These movies are mainly car crashes and one-liners about family for a reason. Dominic Torretto (Vin Diesel) and Letty Ortiz (Michelle Rodriguez) are on their honeymoon in Havana, Cuba. At first, everything starts off great — and pretty typical. Dom races a Cuban local through the streets of Havana in a thrilling sequence that is one of the high points of the movie. A few minutes later, everything falls apart when Dom runs into a mysterious woman (Charlize Theron) on the street who appears to be having issues with her car. After about three hours of talking, it is revealed the woman is a hacker named Cipher who Dom and the rest of the team have pursued for years. Cipher has some major dirt on Dom and blackmails him into betraying his friends and joining up with her as she tries to start a nuclear war. Otherwise, the plot does not go much further than this. Cipher’s motivations remain unclear and the team must figure out how to proceed with one of their own fighting against them. From here, the film is constantly interrupted by Cipher and Dom. These two dominate the screen time so much the usual suspects from the previous movies get shoved into the background. Cipher is on screen endlessly. Theron’s purpose here is not to drive cars into other cars or do something entertaining, no, no. Rather, Theron is forced to deliver constant rambling monologues in a villainous, monotone drone. “Mad Max: Fury Road” showed Theron is competent, especially in action sequences. But, ironically, “F8” gives her nothing to work with of that sort. My wallet turns to ice at the thought of watching Theron drone on in the inevitable sequels. The action drizzled throughout the middle looks great, but there is little here that is overly satisfying or exciting. There’s a scene involving self-driving cars that should be cool, but quickly becomes too much of a jumbled mess with no intensity. Overall, much of the middle drags. The problem is, if I am thinking during a “Fast and Furious” movie, something is wrong. If I want to think, I’ll go home and read “Great Expectations.” Before that book puts me to sleep, I will spend five or so minutes in deep consequential thought. If I want anything resembling a narrative, I’ll go to the men’s room and check out the scribbles in stall #2. Give me car crashes and explosions for two hours, not monotone rambling from Cipher. The formula for a successful “Fast and Furious” movie is clear-cut. Adding anything to this recipe increases the risk of churning out a pile of slop. “F8” is not a pile of slop. 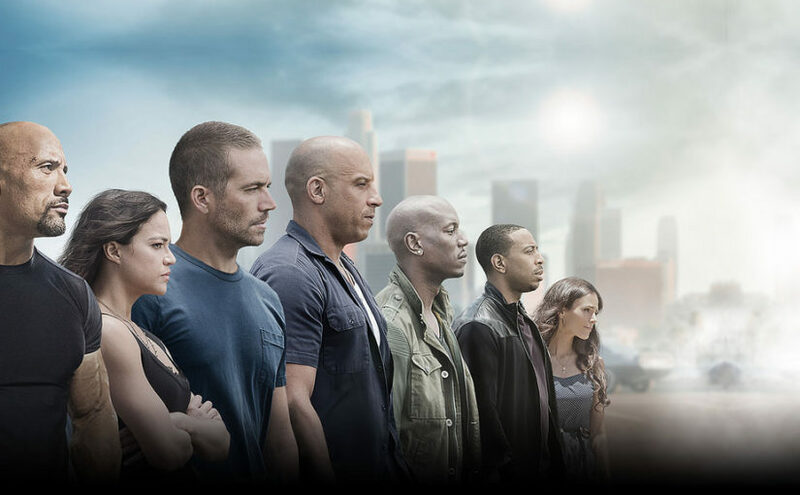 Most of the action sequences are shot and laid out flawlessly, as a “Fast and Furious” fan expects. The race in Havana is fun, the climax is cool and the Rock is entertaining throughout the entire film. However, Cipher is boring, the dialogue feels cheesier than usual and using a baby as a prop in an extended action sequence is not nearly as amusing as the producers think it is. Dwayne Johnson and Jason Statham are the brightest stars in “F8.” The Rock’s movie career has come a long way since he quit wrestling for Hollywood and he has tremendous chemistry with Statham. The pair is involved with a prison sequence that is rather quick — but one of the best in the film. If you’re a fan, “F8” will make you content. The film leaves the door open for endless sequels which “F8” did not make me want to see — unless it involves Dwayne Johnson and Jason Statham front and center.